Nature reserves funded by WLT are rich in biodiversity but have often already suffered extensive damage and fragmentation. Many natural areas have suffered habitat loss and degradation by logging or livestock grazing. 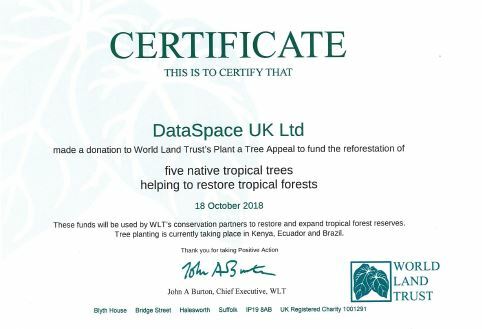 DataSpace donate every year to the Plant a Tree programme, WLT partners will plant a tree, care for the sapling, and protect the tree in perpetuity, to restore a damaged habitat for wildlife. Currently WLT is working with Naturaleza y Cultura Ecuador (NCE) in Ecuador to plant trees in the Nangaritza Reserve and with Reserva Ecológica de Guapiaçu (REGUA) to plant trees in the Guapiaçu reserve in Brazil. If you want to help World Land Trust by donating or just reading about the wonderful work they do all over the world Click Here.